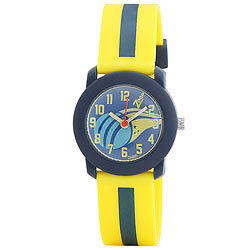 Send this special surprise of Fashionable Yellow/Blue Analog Kids Watch from Titan Zoop to your dear kids and make them smile. Gift you kiddo this fancy watch that will surely be loved by him. This plastic watch is water resistant, lightweight, durable and comes with 9 months warranty.